More diverting than the travails of Dickens characters in many cases are tales from the careers of creatures more fantastical and enigmatic than even Uriah Heep, Mr. Murdstone, and Daniel Quilp: opera singers. Singers’ lives both on and off the world’s stages brim with great expectations, hard times, and experiences that are at once the spring of hope and the winter of despair. Careful singers endure. Embodying William Faulkner’s oft-quoted affirmation, conscientious artists prevail. Amongst the chronicles of bad choices, overzealous ambitions, and abused natural gifts, there are occasional beacons of self-cognizance, well-informed decision making, and unimpeachable musicality, artists whose cognitive abilities are as refined as the products of their vocal cords. 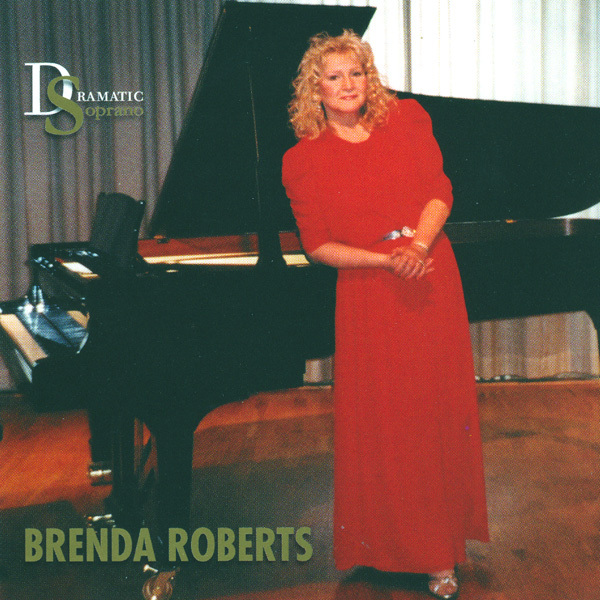 Shining amidst these exemplars of nurtured talent and continuously-honed technique is the career of American dramatic soprano Brenda Roberts. Renowned as the youngest singer to brave the demands of any of the three incarnations of Brünnhilde in Richard Wagner’s Der Ring des Nibelungen at the composer’s own Bayreuther Festspiele, her voice bears few of the scars of the sort of imprudence that such a distinction suggests. The story of Roberts’s career to date is a cautionary tale in a vastly different sense than the misadventures of some of her fellow American exponents of Hochdramatische repertoire. Hers is a fire fueled on her own terms, not stoked to unsustainable pyrotechnics and prematurely extinguished. Her rightly storied portrayal of the Siegfried Brünnhilde at 1974’s Bayreuther Festspiele, an achievement shared with Wagnerians throughout the world via radio broadcast, is but one page in an extensive performance diary that has taken her to opera’s most hallowed halls, from Lyric Opera of Chicago for Strauss’s Elektra—another broadcast performance—and New York’s Metropolitan Opera for the Färberin in the same composer’s Die Frau ohne Schatten to Teatro alla Scala for Ortrud in Wagner’s Lohengrin and the Wiener Staatsoper for Strauss’s Salome. Born in the small northwest Indiana town of Lowell, Roberts set her sights on a career as an opera singer whilst still a schoolgirl and never deviated from that goal, eventually studying at Northwestern University with noted pedagogue Hermanus Baer, a tireless advocate of understanding and mastering the physiological components of singing in order to realize the voice’s full potential whose pupils also included Sherrill Milnes. Her successes on the world’s stages have not diminished Roberts’s lifelong commitment to unceasing vocal training and exploration of new repertoire. Her Carnegie Hall début occurred as recently as 2011, when she sang the music heard in this recorded Liederabend, as well as Gustav Mahler’s Lieder eines fahrenden Gesellen. Following rather than coercing the path of the voice’s development, Roberts continues to exhibit the shrewd judgment that has enabled her to navigate the perils of a career as a singer and among singers. Recorded in 2001, the present disc is the work of a major artist as well as an exceptionally capable and prepared vocalist. Composed in 1857 and 1858, at the apex of their creator’s passionate but almost certainly platonic obsession with his patron’s wife and host in comfortable exile, Wagner’s Fünf Gedichte für eine Frauenstimme (WWV 91)—later christened as the Wesendonck-Lieder, taking the name of the author of their texts and the object of Wagner’s infatuation, Mathilde Wesendonck—are the most familiar selections in Roberts’s Liederabend. Familiarity unfortunately does not equate to an overabundance of superlative recorded performances of the Lieder, so this recording by a singer for whom Wagner’s music is congenial territory is atypically welcome. It cannot be claimed that Mathilde Wesendonck was a major poet, but when a singer traverses the restless line cresting on top A♭ with which Wagner allied her words in ‘Schmerzen’ with the attention to note values and textual clarity that Roberts brings to her performance the earnest Frau Wesendonck’s endeavors assume heightened importance. Poetically, the finest of Wesendock’s texts is that used by Wagner in ‘Träume,’ in which Tristan’s and Isolde’s ecstatic love duet was born. Roberts and Schmitt-Engelstadt unerringly blend the piano vocal line with the pianissimo accompaniment, and the soprano again impresses with the accuracy of her pitches, not least in the A♭-A♮-B♭-B♮-C-B♮-C-C♭ sequence on the words ‘sanft an deiner Brust verglühen’ and the consequential descent from B♭♭4 to C4 on ‘sinken’ in the Lied’s final bars. Roberts refuses to wallow in sentimentality in her singing of these songs, approaching them not as exalted products of a legendary genius but as songs that require no ostentatious grandstanding. Still, this performance of the Wesendonck-Lieder is an indispensable document of Roberts’s preeminence as an interpreter of Wagner’s music. Virtually all of Richard Strauss’s 174 Lieder for voice and piano are performed with some degree of regularity, but even within this trove there are songs that seldom appear on singers’ recital or recorded programmes. Published in 1918, the Sechs Lieder of Strauss’s Opus 67 are works of great difficulty, appealingly tuneful in the fashion of the composer’s most popular songs but also bitingly modern. The Drei Lieder der Ophelia are settings of passages from Shakespeare’s Hamlet, and they suggest that Ophelia might have been as engaging a Strauss operatic heroine as Salome, Elektra, Ariadne, and the Marschallin. Roberts and Schmitt-Engelstadt perform the first of the Ophelia-Lieder, ‘Wie erkenn​’ ich mein Treulieb vor andern nun,’ idiomatically, Roberts’s integration of the climactic top G♯ into her expansive phrasing identifying her as a Strauss singer to the manner of Dame Elisabeth Schwarzkopf, Sena Jurinac, and Irmgard Seefried born. Her singing of the frenzied vocal line of ‘Guten Morgen, ’s ist Sankt Valentinstag’ conveys the girlish bawdiness of the text, her top A projected with an apt demonstration of the vigor with which Ophelia hurls her words at Claudius in Hamlet. The darkest of the Drei Lieder der Ophelia, ‘Sie trugen ihn auf der Bahre bloss’ is characterized by alternating passages of grim lyricism and manic episodes in triple meter, the vocal line again rising to top A. Here, aided by Schmitt-Engelstadt’s committed playing, Roberts proves herself to be as estimable a Shakespearean heroine as a Strauss singer. Pronouncing the words of Karl Simrock’s translation of Hamlet with the instincts of a great tragedienne, she finds and discloses to the listener the significance of each of Strauss’s shifts of musical direction, elucidating both the character’s and the composer’s psychological motivations. Employing texts from Johann Wolfgang von Goethe’s West-östliche Divan, the Drei Lieder aus den Büchern des Unmuts des Rendsch Nameh are the second half of Opus 67, and these songs contrast markedly with the Drei Lieder der Ophelia. The first of the Goethe songs, ‘Wer wird von der Welt verlangen,’ embodies the cynicism that lurks beneath the surfaces of these songs, and the unaffected performance that it receives from Roberts highlights the sagacity with which Strauss mined the loads of philosophical profundity in Goethe’s words. ​In addition to alluding to his Alpensinfonie, Strauss visited the melodic realm of his then-unperformed opera Die Frau ohne Schatten in ‘Hab’ ich euch den je geraten,’ the ‘borrowed’ melodies soaring above the low-lying vocal writing. The plunges to the bottom of the voice do not trouble Roberts, whose intonation is as secure below the stave as elsewhere. Entitled ‘Wanderers Gemütsruhe’ by Strauss, ‘Über’s Niederträchtige niemand sich beklage,’ should be counted among the composer’s finest Lieder. The Lied’s unmistakable kinship with the weary, wistful moods of music dating from three decades later, in the last months of Strauss’s life, is made all the more apparent by the emotional sincerity of Roberts’s singing. Her delivery of the line ‘Wandrer! Gegen solche Not wolltest du dich sträuben?’ is no stentorian outburst: the words are truly sung, not shouted, and the top B♭ is caressed. Many singers perform Strauss Lieder, but far fewer perform these Strauss Lieder—and fewer still perform them well. It is not surprising that an accomplished Salome, Elektra, and Färberin is closely acquainted with Strauss’s music, but Roberts’s performances of the Sechs Lieder of Opus 67 revel in the intimacy that many singers fail to perceive. It is not inaccurate to assert that Franz Schreker’s music is widely neglected, but the obscurity imposed upon his Lieder is particularly inexplicable and unjust. First published by the Viennese firm Eberle in 1904 and likely composed in 1899, the Fünf Lieder of Schreker’s Opus 4 present many challenges to both singer and pianist, challenges that, when met, reward performers and listeners as marvelously as those of the most popular Lieder. Leo Tolstoy’s words inspired Schreker to writing of unquestionable brilliance in ‘Unendliche Liebe,’ and Roberts reaches first the top A and then the fortissimo top G with obvious reserves of power. The text of ‘Frühling’ is by Karl Freiherr von Lemayer, and Roberts and Schmitt-Engelstadt bring the words to life by punctiliously heeding Schreker’s ‘Zart bewegt’ direction. Theodor Storm’s words in ‘Wohl fühl’ ich wie das Leben rinnt’ are similarly enlivened by Roberts’s vocalism. The technical acumen with which she executes the diminuendo on ‘du bist mein letztes Glück’ should be studied by all aspiring Lieder singers. There is an almost Baroque sensibility to Schreker’s setting of Julius Sturm’s text in ‘Die Liebe als Recensentin,’ and the fidelity of Schmitt-Engelstadt’s realization of the composer’s ‘Zierlich’ marking enables the soprano to traverse the vocal line with perfectly-gauged but what seems like near-improvisatory freedom. The arching phrases of ‘Lenzzauber’ uplift Ernst von Scherenberg’s text, and singer and pianist perform the song with flawless cooperation, both of their instruments singing in tandem. The modicum of toil that it costs her gloriously repaid, Roberts’s sterling top B recalls the fresh-voiced ease of her dashingly youthful Brünnhilde and the blazing top C with which she conquered Bayreuth. That a quarter-century lay between that Bayreuth Siegfried and this Liederabend is scarcely apparent. Voices evolve as they mature, and too few singers demonstrate cognizance as complete as Roberts’s of the fact that artistry must also evolve. Much as they have suffered in the world’s conservatories and theatres in recent years, large voices have almost never been treated kindly by microphones. Among all of the products of the extensive time that she spent in recording studios throughout her career, only her 1972 recording of the title rôle in Puccini’s Turandot—a part that she never played on stage—conveys a true-to-life sense of the amplitude of Dame Joan Sutherland’s voice as heard in opera houses and, in some cases, on noncommercial recordings. A similar assessment of Kirsten Flagstad’s recordings is not unjustified: her 1954 Norwegian Radio performance with piano accompaniment of ‘Im Abendrot,’ the fourth of Richard Strauss’s Vier letzte Lieder, is perhaps the single best recording via which to appreciate the pure impact of her voice. There is a disturbing trend of substituting volume for projection evident in the work of many of today’s singers, precipitating forcing that is especially dangerous for large voices. Recorded without the exhaustive processing that renders many discs technological rather than vocal feats, this Liederabend is a rare instance of a recording permitting the listener to encounter a remarkable voice without non-musical impediments. Merely as a recording of one of America’s great voices, this disc is uncommonly enjoyable. As an artistic journey through Lieder by three masters of the form led by the sapient proprietress of that great voice, it is a Liederabend to quiet the laments of those who wrongly believe that the insightful, imaginative, and indefatigably musical interpretation of song is a dead art.